The increase in flow last week on the Gunpowder created ideal conditions for fishing at 115 CFs. The trout certainly had more room to spread out, and were far less wary than at 55 CFs. 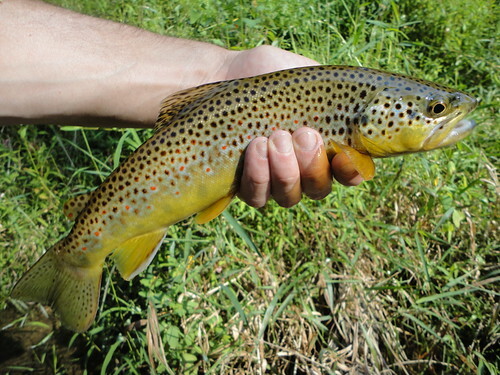 I caught quite a few browns around ten inches, and the larger wild brown above. This pretty trout was just under fourteen inches, nicely colored with a large head. The shop was informed this morning that flows will increase today from double to possibly triple the current flow. The flow will increase incrementally today, and level out anywhere from 275 to 350 CFs. This larger release will send more water to fill Loch Raven Reservoir, and the higher flows should remain until that is completed. I’d wager a guess and say the higher flows will continue through this week, and into the weekend. Anglers reported this morning that the water is already rising, and at this time (2:27 pm) the flow is at 251 CFs on the Falls Rd gauge. These higher flows may be considered less than ideal by some, but the anglers in search of larger fish welcome these conditions. Now is the perfect time to fish streamers and heavy nymph rigs in search of bigger browns on the Gunpowder. The finicky wild browns either become less wary, or start feeding due to nymphs being washed down river. The higher flow may also increase the water temperature, since the increase from 55 CFs to 115 CFs also raised water temps from 48 to 51 degrees. The combination of warmer water, higher flows and dislodged food sources can lead to some great fishing. The downside to the higher levels is more difficult wading, and river crossings limited to the wider, shallow sections of all access points. The majority of rivers and streams in the region are still too low and too warm for trout fishing. Fortunately the need for drinking water also benefits the trout (and anglers) during a time when few would expect a chance to experience fishing “big” water in late Summer. In the latest video post I included some shots of a few nice browns I caught one day last week. This entry was posted in fishing report, video on September 7, 2010 by Jason du Pont.